I'm an average woman with a passion for adventure and adventure sports which I approach, by my estimate, in a fairly wimpy way. I see some amazing talent out there and hats off to them. Props to others like me who enjoy their sports with moderate talent but fully engaged and joyful doing them! I have always had a passion for seeing new places and experiencing different cultures. So when I was asked to join Sam and the eNRG management team for a scouting trip down to Ecuador my reply was “Hell ya!!”. I’d never been to South America and this would be a paddle-focused trip. Let’s go! Sam and I arrived early, to enjoy a little “us” time before the others arrived, and to make sure logistics were good to go. He had hired a personal driver with a 10 passenger van plus secured accommodations everywhere we were visiting (another treat as I’m typically the person figuring logistics for personal and client-based trips). In Quito I was pleasantly surprised to find our lodging really cute–a clean hostel owned by a Dutch man who had run this little venture “Aries Cabins” for 27 years, having married an Ecuadorian woman and relocated there. While his bedside manner was “sharp” he knows his stuff and his service is great. On to Quito!! Sam and I arranged to meet up with Favian and his brother after a few hours so we could explore, at our pace the sites of Colonial Quito. It is a beautiful and vibrant city (reminiscent of many towns we’d explored just a few months back in Europe). A fabulous experience nonetheless. The opportunity to speak Spanish and learn the city from a local’s perspective is, in my mind, priceless even considering Favian drove us WELL out of way to pick up and drop off his brother. That’s alright…kind of how this stuff goes. A side note here for anyway new to travel and reading this blog as a resource. My luggage got lost. Again. Same as our flight into Paris. When flying internationally I recommend you pack a minimum of two pairs of underwear, toothbrush/toothpaste and a change of clothes. It helps a ton, particularly when you get run through the many iterations of where your luggage is. I was told no less than four stories…none true…regarding the location and arrival time of my pack. It did finally arrive around noon about 36 hours later. Do yourself the favor and prepare. Just in case. Good luck. The rest of our crew arrived about the same time as my luggage. After some repacking we left Quito bound for Banos (a small town which reminded me vaguely of Sayulita, Mexico…a sort of hippie, international traveler-welcome town with cute shops and a friendly energy). However, we stopped along the way for lunch at a traditional restaurant serving a standard, single lunch option. Rice, salad (don’t eat lettuce or tomatoes in South America) and a meat/gravy entree. The meat, we were explained by Favian, was stomach. I will always TRY everything. While I didn’t prefer the taste, others in our group enjoyed it. This wouldn’t be the first of many diverse meals we ate. And as I said, I’ll always try. We ventured on…and if you’re interest is peaked, please stay tuned. The adventures began from there. So much has happened in the last month! Crazy, this life we live. I’m grateful to KM Collins, free lance writer for getting excited about a project that means so much to me. Check it out if you’re interested…. Another Trail Tales: A Conversation With Inspiring Community Members happened this last Tuesday. This month, I had co-host Denny Dragan up there with me. I wrote about Denny last summer as one of the people that really supported me through my MCL tear. He was, in fact, my physical therapist (and probably as much my emotional therapist). Denny is the kind of guy that makes every single person he talks with seem like they’re the most important person in the world. Great guy and was relieved to have him up there with me this last week. We talked with two guests, Rick Wright and Adam Short. Rick is a long-time whitewater paddler in the Bend area. He’s a true community member, sitting on the board of both the Upper Deschutes Watershed Council and the Downtown Association, and is extremely humble and well spoken. His story was poignant and the audience had a ton of questions for him. It was awesome to get some real dialog going! This was a big part of Jaymo’s and my vision for this talk series. I particularly liked hearing about his assistance to paddlers who get into trouble on the rapid in front of his house. Appropriately named after him “Wright Stuff”, it’s the first of the serious rapids on the town stretch “Riverhouse” and has given many paddlers a run for their money. Adam was also a great guest, and turns out, the husband of a friend of mine which made it all the more interesting to me. This is so typical of Bend…we truly are still a small community. Adam was a pro-snowboarder and like many pro athletes realized his run had an expiration date. He determined to go back to school and became a PA at Desert Orthopedics. He helps people who’ve been injured via his work while raising his family of three kids and wife Tammy (awesome dancer, teacher and human). The night was good, but here’s my “secret”. I was barely functional having been to the ER just two nights before. I’d spent the previous 2 days sleeping and surviving in considerable pain. I was only partially coherent when “interviewing” these guests. I won’t go into detail other than to say it was stomach-related and meant a clear liquid diet for several days. No bueno. I hate the feeling of being helpless and alone in my studio. It’s a scary feeling, perhaps worse than the pain. I’m on the mend now which I’m grateful for, but I am more grateful for a few people who supported me in this. A friend who called and stopped by with medication and well wishes, and Denny who prior to the event, literally had me laying on the floor of the pub doing adjustments (upstairs before anyone arrived) trying to relieve my head/neck pain that had accrued from laying in bed so much. It’s important to acknowledge that even when we feel alone, we’re probably not. It truly is about community and I’m fortunate to be a part of an awesome one. The greatest of thanks to those who helped….We’re paddling this canoe together after all!! Thanks for listening. It was a stunning fall morning on the back deck at Tumalo Creek Kayak & Canoe. Myself and K.M. Collins, were laughing and chatting about my project “Trail Tales: A Conversation with Inspiring Community Members”, as she prepped the camera for a live interview. This particular interview was important to me on multiple levels. For one, it seems like “Tales”, a monthly event at the Deschutes Brewery is gaining some traction. It’s a really personal project for me and perhaps I’m the most inspired out of anyone, talking with the potential guests and co-hosts. When people ask what it’s all about I describe the idea behind this monthly discussion, and I get fired up all over again! The other reason this interview was important to me is that I know K.M. Collins on a personal level. Collins and I first met awhile back…perhaps 5 years ago?! Wow. Time flies. 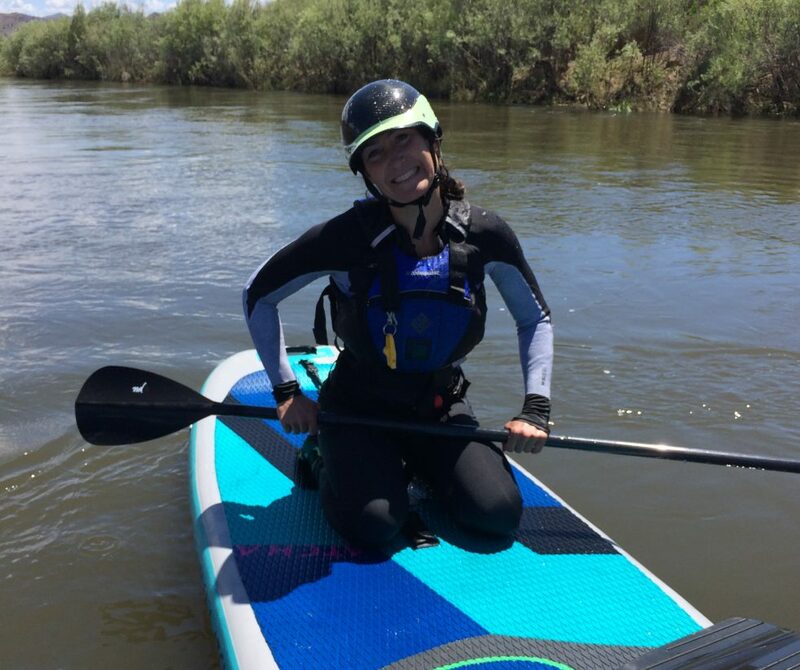 She was enthusiastic and positive, just getting into the sport of recreational paddleboarding. It was toward the end of the peak summer season, at a time when I was spending, on average 3-5 hours a day on the same stretch of flatwater, instructing beginning SUP group and private lessons. I will never forget an interaction with her– I was getting ready to launch my small group of newbie students (full disclosure, after teaching the same basic class maybe 100 times over the years, you can get burnt out). Collins was returning from a solo paddle and said to me as I was setting out on the water “Yeah homie…are you totally excited to get out there?”. In that moment I laughed to myself…ummmm no? But something about her positivity and authenticity led me to consider something. I might have uttered these same instructions to students over and over and over, but for these four paddlers it was the VERY FIRST TIME. It was a pivotal moment. Since that day I’ve reminded myself that I am privileged to be a part of these students’ experience. I get to show them for the first time, in many cases, what paddleboarding is about. I get to set the stage for an activity that, if it goes well, can enhance their life in many ways….health-wise if done for exercise. Socially if paddling with friends. Perhaps it’s a way to experience the water for those individuals who previously had no connection to the water. This SUP instruction stuff is a gift!! I was taking it for granted. I appreciate Collins’ words that day for reminding me how fortunate I am, and also her continued enthusiasm with SUP and all kinds of other activities because she still keeps me on my toes. She is passionate about gaining accessibility to the water, for all people and especially women. I admire her commitment–she exemplifies the inclusive, community-minded human. Collins is the first to encourage a fellow woman to try out a sport, not only with words, but making herself present to help. Thanks for listening, and hope to see you there!! I’ve written of my dad before, but it’s been awhile. To sum up, my dad is in later stages of Alzheimers disease. At times, I’m still in disbelief, even though it’s been evident for almost a decade. This last weekend Sam and I took my dad and sister down a stretch of the North Santiam river. For my dad, it was his second year in a row he’s rafted this same stretch with us. Last year he sat upright and even grabbed a paddle and tried to help. Regardless of the direction he was paddling, it was still an attempt. This year, not so much. Recently I’ve begun a project with a friend doing monthly “talks” at a pub. Our “show” is called Trail Tales: A Conversation with Inspiring Community Members. The point is to engage with individuals from our community that are experts or exceptional…mmmm not sure what descriptors work best here…in the outdoor industry. However, the reason we choose our guests is for their outstanding involvement in the community. Their achievements as humans. While it would be impossible to interview my dad (he barely talks at this point) I think he’d qualify. Note: perhaps I’m not objective but isn’t that how a daughter should view her dad? I can’t actually say my dad was ever an exceptional athlete. But he’d try anything. He did the occasional whitewater rafting and also kayaked a class III section of the Owyhee, with basically no experience, following the lines and instructions his experienced friends told him. He was a runner (ran the Boston marathon three times) and later a triathlete. In his youth he was a football player (and played in the band, which led to funny stories he’d tell us of playing at half-time in his band uniform). What stands out in my mind was his involvement with community and his generosity to his friends, family and strangers. I remember when his best friend became tragically ill with a brain tumor. The final month of the man’s life was very much a struggle, and his petite wife was challenged to meet his basic needs (Bob was a tall man therefore caring for his basic functions while essentially dying at home was unbelievably tough for her). Eventually my dad stepped in to give her breaks. He helped in all the ways a person must when helping someone who lacks the ability to take care of their own needs…bodily functions, bathing, etc. I can’t imagine it was easy for my dad, but he took it in stride and with love. Cruelly ironic with the situation as it is now–the dynamic is not lost on me when I help. When putting together a legal plan for my mom and dad after his diagnosis, we sought the help of a local attorney who knew and had worked with my dad. He was a lawyer in Salem for most of his life…well liked and respected. It was only when we visited this particular attorney did we learn of his career-long compassion. She wouldn’t allow us to pay her because she “couldn’t in good faith charge us…your dad helped so many people for little or no fee”. I find myself wondering, when I write these posts, what my point is. What’s the message? In a writing class I’d be criticized for rambling and not having a clear intro, middle and end to these “stories”. Maybe that’s why I enjoy the blog format so much—YOU don’t have to read them and I’m not being graded…haha! My point with this particular post? Well two-fold: One, I’ve been writing and talking with people recently about the importance of community and helping one another out. We’re all paddling this canoe together. I believe my dad exemplified this well. Two, I love and respect my dad for being an incredible human and I realize the older I get, we haven’t all been as fortunate. I’m grateful, and if you feel that way too about your dad, give him a call today. Or email. Or text. Whatever works for you, but let him know you care.